Stay Up-to-Date by Following us on Twitter! 3D printers are amazing machines that allow us to create and explore the furthest reaches of our imagination. The capability of turning a concept to reality in just a matter of hours is incredibly powerful. - That is, of course, as long as the printer doesn't goof up! 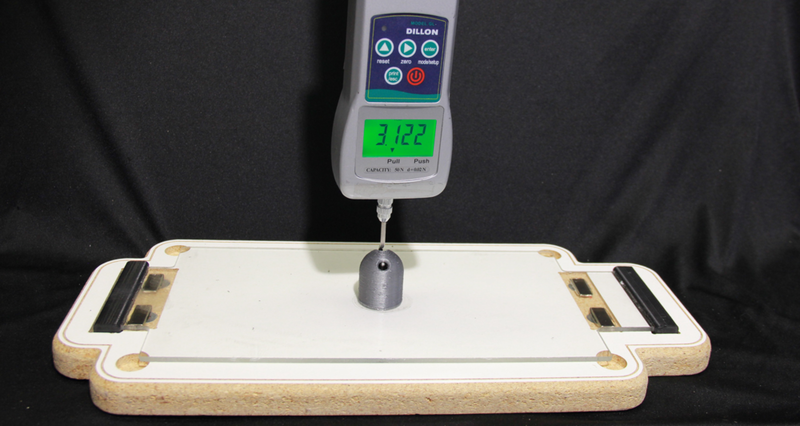 3D Gloop is a specially formulated adhesive compound designed specifically to increase print adhesion to heated and unheated glass, metal, and even taped build plates on any 3D printer! Our unique adhesive formula is easily brushed or sprayed onto the surface of a 3D printer’s build plate. As the adhesive dries, nano-particles constructed from PLA or ABS plastic are suspended in a synthetic elastomer that rapidly polymerizes cementing the nano-particles in place. This rapid polymerization strongly adheres the nano-particles to the glass surface firmly bonding any print with up to 2.0 kg/sq cm (~30 lb/sq in)! 3D Gloop is a force to be reckoned with! Not only does it do many things, but it does them all extremely well. With a single bottle I was able to stick difficult prints down to my build plate, join parts together, and smooth models that become stronger than they began. Definitely a handy addition to my 3D printing inventory! Here are just some of the ways 3D Gloop! can positivly impact your 3D printing experience! Permanently and effortlessly fuse PLA or ABS prints together in seconds! No messy epoxy mixing required. Just brush on a little 3D Gloop! with the built in applicator wand, dropper, or squeeze tube and press your parts together! Nano-particles fuse into the surface of your print as the specially formulated solvent of 3D Gloop! reacts with the print surface ensuring a permanent, long lasting bond. Want to remove layer lines? Brush or spray on a thin coating of 3D Gloop! to the area you wish to smooth and in seconds, you will see a glossy smooth surface begin to emerge! For best results, gently sand your print up to 200 grit then follow up with the application of 3D Gloop! followed by light sanding again. Your part is ready for paint! Multiple applications of 3D Gloop! can be applied, just wait about 10 minutes between applications. Need to cover a lot of area? Bulk packaging is available! Check out our store for up to a 50% discount when buying in bulk! Alternatively, try the spray version of 3D Gloop! (Coming Soon!) for uniform coverage even in hard to reach areas! The Proof is in the Gloop! 3D Gloop! is not your normal adhesive... It took many iterations and a lot of science to finally put an end to some of the most frustrating issues with 3D printing. We know once you try 3D Gloop!, your 3D printing experience will never be the same! - And that's a good thing! With 3D Gloop! Warping is a thing of the past. The unique adhesive formula bonds ABS and PLA firmly to glass, metal, even painters and polyamide taped build plates without expensive upgrades, heated build chambers, or rafts required! 3D Gloop! is easily brushed onto the build surface of your printer just before it's time to print. A uniform coating over the area just a bit bigger than your intended print is all that is needed. Put up to 3 layers down to ensure a super strong hold! *That said, our Gloop is made of science, not magic. If you are attempting tall, large prints, and try to print in drafty environments, your higher layers could still separate and curl, but your bottom layers never will. Once your print is finished, all you have to do is work a scraper/spatula under the print to break it free. Alternatively, if you're headed to bed, you can wait for your print to cool and generally a simple twisting motion will free your print from the build plate. When your're ready to print again a sharp putty knife or scraper peels away the unused gloop easily and effortlessly. 3D Gloop! enables printers such as the CR-10s, LulzBot, Prusa Printers, and others alike to print in ABS without the need for expensive added upgrades. Now we're not talking about turning your printer into a fire hazard by enclosing it in makeshift enclosure, keeping a space heater close by, or pointing heating lamps on your print. 3D Gloop! makes printing in ABS easier on these stock printers than ever before due to its incredible holding strength. ABS print on a room temperature build platform! Printing ABS at Room Temperatures - What??? You still don't believe 3D Gloop! is remarkable? We all know printing ABS is a pain. Let alone ABS on an open form factor printer. That's right... 3D Gloop! remarkably enables the printing of ABS filaments on open form factor 3D printers with cold build plates. Every printer is different, as well as the models they print. For best results, we still recommend a heated build platform for most models, but again, the proof is in the Gloop! Andrew Mayhall and Andrew Martinussen have been obsessed with 3D printing since 2012. As multi-disiplined engineers, they were always up to no good... Building crazy contraptions and exploring the limits of what’s possible with 3D printing. When these two crazy engineers put their heads together they couldn't stop building bigger and better than the other and as such their imaginations exceeded their installations. Searching for a better way to build their fantastical contraptions the duo stumbled upon 3D Gloop! Suddenly, no part was too big, no design too complex, no feature too detailed.